National Trail’s Miami Valley Career Technical Center (MVCTC) FFA Chapter held its annual Legislative Luncheon on Friday, March 23. 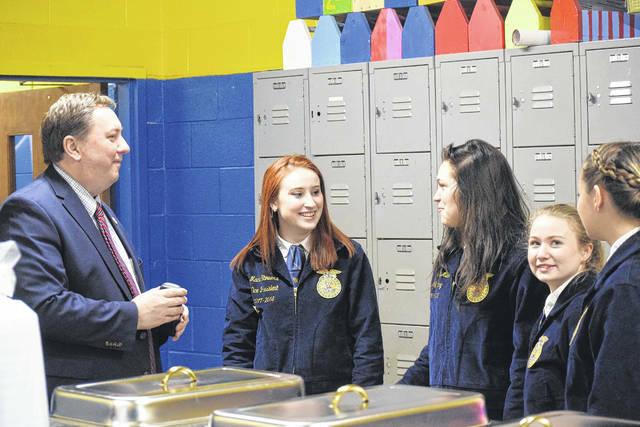 The luncheon brought FFA students together with community representatives and state legislators to eat and converse, bringing the students a valuable opportunity that most people don’t get to experience. 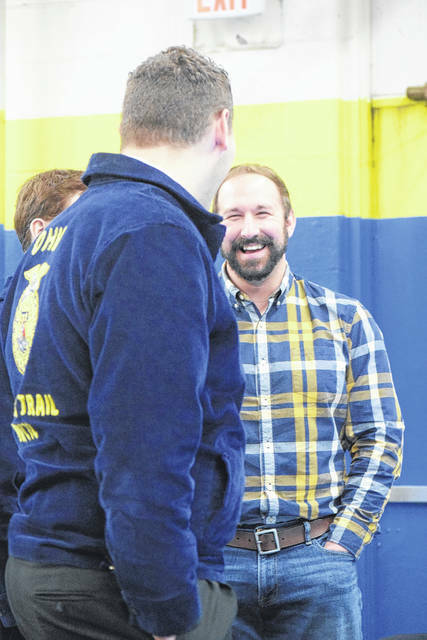 Pictured, State Representative Jeff Rezabeck speaks with FFA members. For NT MVCTC Chapter President Erika Gallaher, and Student Advisor Dawson Ward, the Legislative Luncheon is just another example of the positive influence FFA has had on their lives. 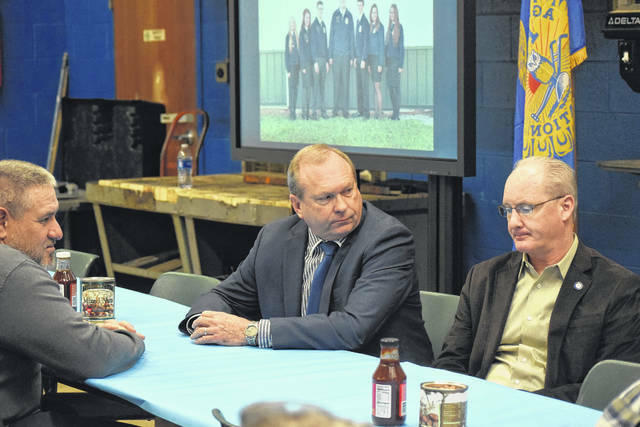 Gallaher said, “Having these farmers and legislators together is very important, because it opens your eyes to all of the things that are happening, even in a small community.” Pictured, State Senator Bill Beagle spends time with NT FFA members. NEW PARIS — National Trail’s Miami Valley Career Technical Center (MVCTC) FFA Chapter held its annual Legislative Luncheon on Friday, March 23. 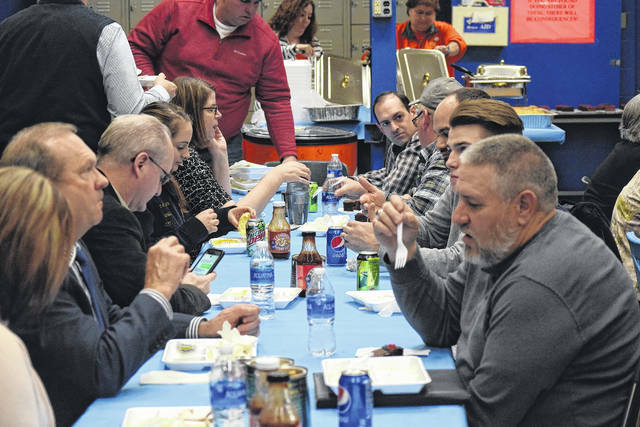 The event brought FFA students together with community representatives and state legislators to eat and converse, bringing the students a valuable opportunity most people don’t get to experience. “Our executive committee organized the legislative luncheon. Last year we focused on educators in our school district, this year we wanted to bring our community members in, the farmers in the school district. We invited community farmers, and we had 10-15 RSVP — they had other Ag meetings they were going to this afternoon. “The farmers we have sitting around, the different community officials, the students get to see and interact with folks and it improves their leadership and communication skills,” Kennel added. For NT MVCTC Chapter President Erika Gallaher and Student Advisor Dawson Ward, the Legislative Luncheon is just another example of the positive influence FFA has had on their lives. “We sat down at our retreat and planned the event out. We made a list of who we wanted to incorporate and then we found their contact information and made phone calls. We also sent out official invitations,” Gallaher said. “The interesting perspective for me is, I was fortunate enough to get the opportunity to sit in on Rotary Club and talk with them. It was very interesting, because since we are living in this small community we think we are aware of what is going on, but there are so many things that we have no idea. 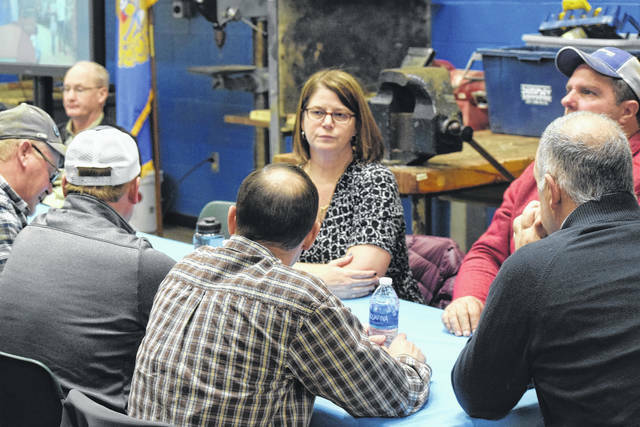 People are motivated to make changes and go different directions — having these farmers and legislators together is very important, because it opens your eyes to all of the things that are happening, even in a small community,” Gallaher said. “By joining FFA I have made a lot of connections and I got to learn a lot of adult skills, like public speaking. I used to be shy, and FFA has made me a lot more ready for the adult world,” Ward said. According to Kennel, the chapter worked with the New Paris Chamber of Commerce to host the Legislative Luncheon. 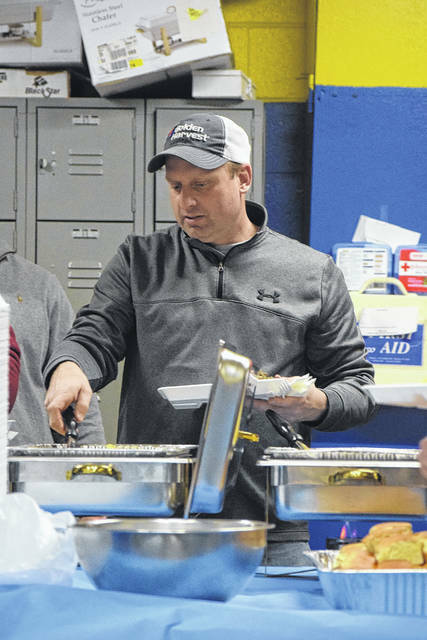 The food provided was donated by the Preble County Pork Festival through the Community Outreach Day with the Driven Foundation. Food was prepared by Food Service Supervisor Dorothy Frist, who continues to be a important supporter of the FFA chapter. 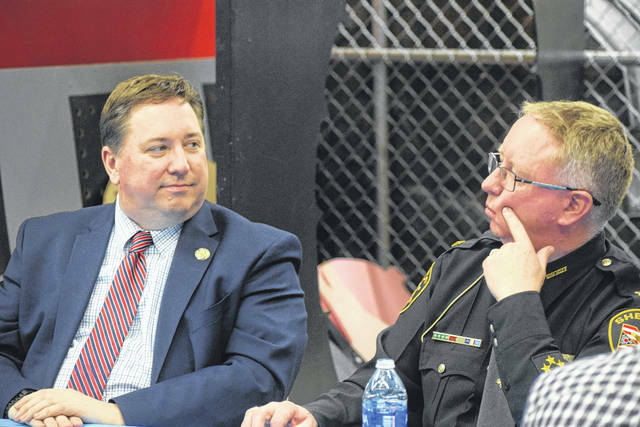 https://www.registerherald.com/wp-content/uploads/sites/41/2018/03/web1_FFA1-1.jpgNational Trail’s Miami Valley Career Technical Center (MVCTC) FFA Chapter held its annual Legislative Luncheon on Friday, March 23. The luncheon brought FFA students together with community representatives and state legislators to eat and converse, bringing the students a valuable opportunity that most people don’t get to experience. 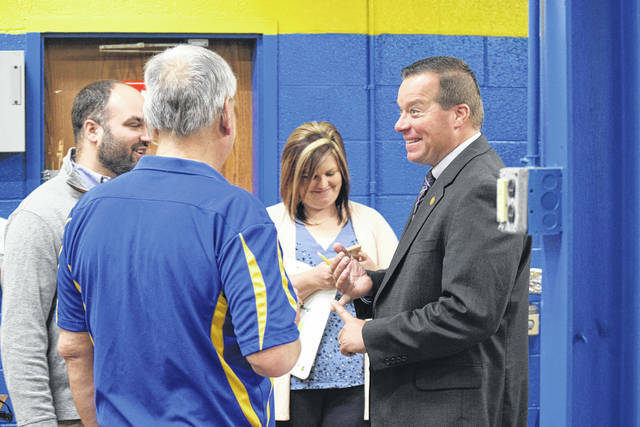 Pictured, State Representative Jeff Rezabeck speaks with FFA members. 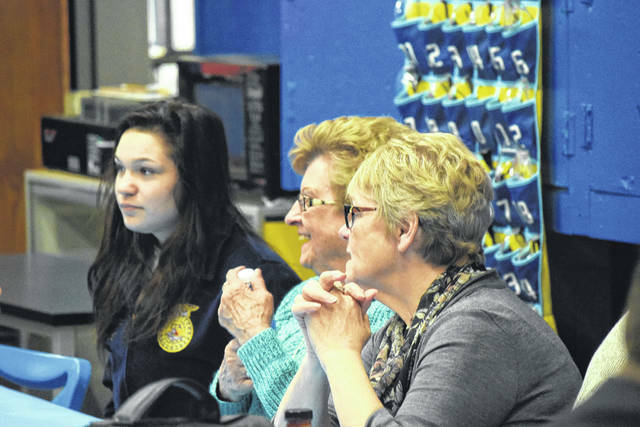 https://www.registerherald.com/wp-content/uploads/sites/41/2018/03/web1_FFA8.jpgFor NT MVCTC Chapter President Erika Gallaher, and Student Advisor Dawson Ward, the Legislative Luncheon is just another example of the positive influence FFA has had on their lives. 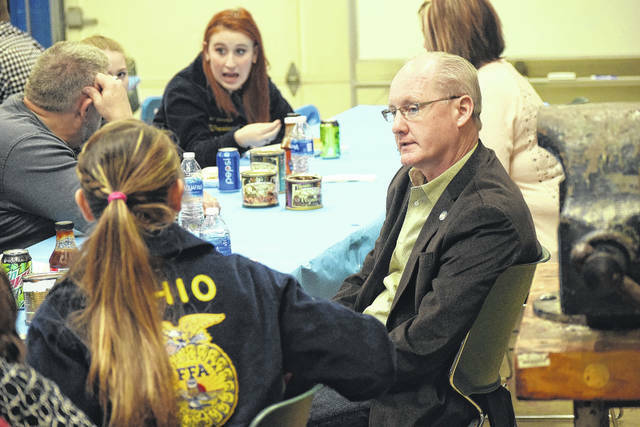 Gallaher said, “Having these farmers and legislators together is very important, because it opens your eyes to all of the things that are happening, even in a small community.” Pictured, State Senator Bill Beagle spends time with NT FFA members.